We recently looked at how to build the case for the employer brand and then measure it. That’s all very well, but how do you build one that your candidates will actually want to buy? One of the arguments we put forward is that your candidates are increasingly more inquisitive – and evaluating far more than the role alone. They’ll want to know what your values and culture is like – and whether it is aligned with their own. And they’ll probably want the answers before they even get into the finer details of the role itself. Candidates have never had more ability to get to the truth. Whether it is your careers website, social media, Glassdoor or Indeed reviews, there is a huge amount of information available to them. And the more engaging and authentic your employer brand is, the greater the likelihood they’ll ‘buy’ your opportunity over that of your competitors. So it helps if you also know as much about your candidates as they’ll want to know about you. We’re going to make an assumption here – that you’ve done a fantastic job of positioning your employer branding internally. The board ‘gets’ it and you’ll shortly have a budget to invest in the process. So now here’s the really challenging part – selling it to that most critical of customer – your actual candidates and existing employees. At That Little Agency, we help employers tell their employment story in a way that attracts, engages and retails their target audience. Every client and organisation is different but the following is a pretty robust process for how we develop and build the employer brand. Would a marketing team launch a new product without first researching the target market and what they might want from this product? No, of course they wouldn’t. But recruitment can sometimes slip through the net, or at least it can without a clear employer branding process in place. That’s why we start by understanding your external audience. What might candidates want from a career with you, and what do they think a career with you might be like? What are they saying on social media? We might even suggest a focus group of target employees. Then we look at your internal audience, exploring in detail their views of the good and the bad while also allowing your people the opportunity to respond to our external findings. By the end of this stage we’ve eliminated the guesswork and you have a very clear picture of what your target audience thinks. Cut corners here and you’ll already be taking risks. The research will have identified what is demonstrably good, and ideally different about working for you. Undoubtedly you’ll also uncover areas for improvement or consideration too. Overall, you’ll have real confidence that we’ve captured the opinions of your workforce. The process will ensure that your employer value proposition (EVP) is fully and accurately represented. And, just like any well planned product offering, it will provide the research based foundation for the creative development of your recruitment identity. 90% of all purchasing decisions are based on emotion and not logic – so why would choosing a new employer be any different? It’s important to ensure that, throughout their recruitment experience, the candidate feels engaged, wanted and welcome. Yes, the recruitment identity is important but it’s equally the candidate experience that will tick those emotional boxes. Do this well and they’ll be more likely to have a greater affinity for your employer brand, feel a stronger emotional connection and a greater desire to work for you. 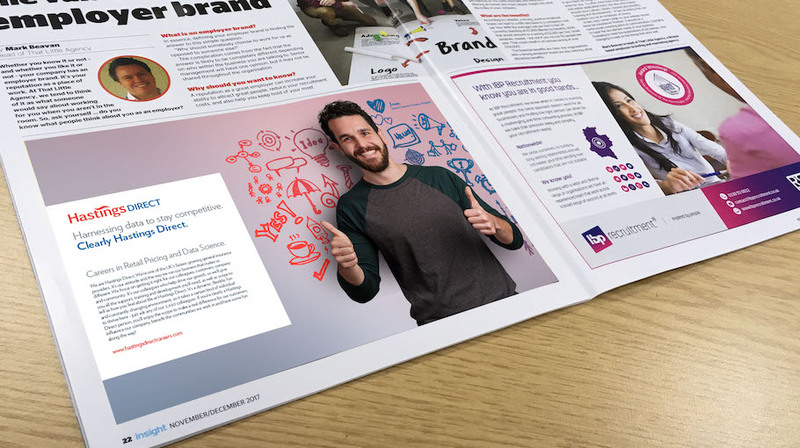 That’s why the creative execution of your recruitment identity must be flexible enough to connect with your target audience – across attraction and recruitment material, particularly your careers website, on-boarding and induction materials, as well as having the flexibility to include any people or recruitment based internal communication. It’s a lot to get right – so you see why we start with research. Recruitment marketing brings your employer brand to life. It puts you in the candidates mind just as they are looking to buy, or at the least doing their own research. The secret to successful employer or recruitment marketing comes from delivering a compelling creative message to the right people – at the right time, in the right place and on the right device. It’s a constantly evolving landscape across career websites, social media, and with new innovation happening all the time, such as the much expected UK launch of Google for Jobs. If Google for Jobs is news to you – you definitely need our free guide. Getting the recruitment marketing mix wrong is like having the best party planned – but no one has sent out the invites.